Church leaders from across the denominational spectrum in the United States meet often throughout the year, particularly in January for what might justifiably be called an ecumenical summit meeting. They look at whether the various ecumenical “instruments” such as the National Council of Churches and the new Christian Churches Together in the USA represent in their present configuration the most effective use of available resources for carrying forward the work of unity among Christians. Why is it important that the organizational instruments be as effective as they can possibly be? The answer to that question is given in the topic for next October’s international Synod of Bishops in Rome: the new evangelization. Unity among the followers of Jesus has two fundamental motivating factors: first, for the glory of God, and second, for more effective mission. Regarding the second, the heart of the Good News is that we are reconciled to God and to one another through the life, death, and resurrection of Jesus. But when we try to bring that good news to others while we are divided amongst yourselves, the message lacks credibility. It’s not enough that we can recite Biblical chapter and verse, or that the individual churches have great programs. If the churches remain strangers to one another, do not share resources, do not engage in mission together, then the gospel of reconciliation we bring loses credibility. The Church of Jesus Christ evangelizes not just by what it says and does, but by what it is. Herein lies a call to the devotees of ecumenism and evangelization to work more closely together. They tend to launch their boats into different bodies of water and to pursue their own interests. The historical task has been to dig new canals between these two bodies of water in order to enable the two groups to contact and cooperate with one another. They have particular spheres of interest and activity: Ecumenists focus on boat, evangelizers on the net. Ecumenists look to whether the boat is seaworthy and whether it has all the tools and equipment a boat should have. Evangelizers ask: What is this boat for? Although the preoccupations of these two groups are not synonymous, neither are they opposite. 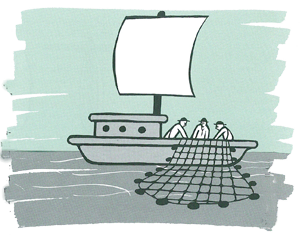 The reason that both the boat and net were made is to catch fish! Whatever tensions and polarities exist between the two spheres of interest and activity are the result of human, not divine, prejudice. Ecumenism relates to the quest for visible unity and common mission among members of different Christian traditions. It relates to believers. Evangelization relates to both believers and non-believers. It invites believers to take their faith to a deeper level, and it invites non-believers into a community of faith. Both are minority movements among general church membership, and both are counter-cultural in that they wish to change the status quo. Evangelists seek to make the church larger and more vibrant by bringing in new members and deepening the faith of present ones, and ecumenists seek to unite those who are already in it. If we could all understand that unity is for mission, we could meet on a deeper level. We could acknowledge and applaud one another’s gifts and efforts, and we could work more effectively together. The simple fact is that if your boat is leaking, it prevents you from having all hands on deck involved with throwing out and bringing in the nets. And the divisions among us as Christians are leaks in our boat. Evangelists and ecumenists today are working more closely together, and there are some pleasant surprises. Evangelizers have discovered that whole new spiritual worlds open up in ecumenical dialogue and that these spiritual worlds are inhabited by other people who love the Lord. They have discovered that a good ecumenist is constantly being evangelized by other Christians. And ecumenists are learning to measure not only by the number of churches united, but also by the number of new churches planted as a result of unity efforts. So if unity is for mission, evangelizers do well do know what it means to be “ecumenical”, and ecumenists to know what it means to be “evangelical”.